I look for two things when I’m searching for dinner ideas… First the recipe has to be incredibly simple and second it has to taste great. 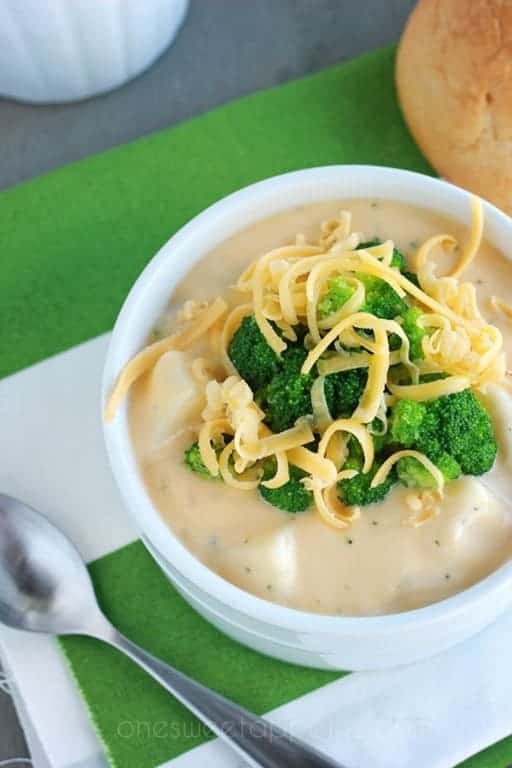 This easy broccoli cheese soup managed to hit a home run in both of those categories. It’s quick, easy, and needs to be in your belly. Right now. I do have to confess that the secret isn’t really anything special. It’s Velveeta. I’ve tried so many versions using sharp or medium cheddar but non have surpassed the flavor of this bowl of processed goodness. The original recipe was found in the Real Mom Kitchen cookbook and I have slowly adapted it to fit just right. My youngest sister, who absolutely despises any sort of processed cheese, will do anything for a bowl. She has called me numerous times begging me to bring her some. When I brushed her off the last time she showed up on my doorstep with all of the ingredients in hand. So before you head for the hills running give it a try. You’ll like it. I promise. It also happens to be freezer friendly which is important for my family of three. A lot of the time meals will go to waste and leftovers will never see the light of day once they are packaged and pushed to the back of the refrigerator. With this recipe I can fill a freezer safe Ziploc, label, and freeze for a quick meal later on. Which is especially handy on cold winter days when I need some warm comfort food to cheer me up. Whisk together your water and soup in a large pan. Stir in the onion and potatoes and heat to a boil. Simmer for 10 minutes. 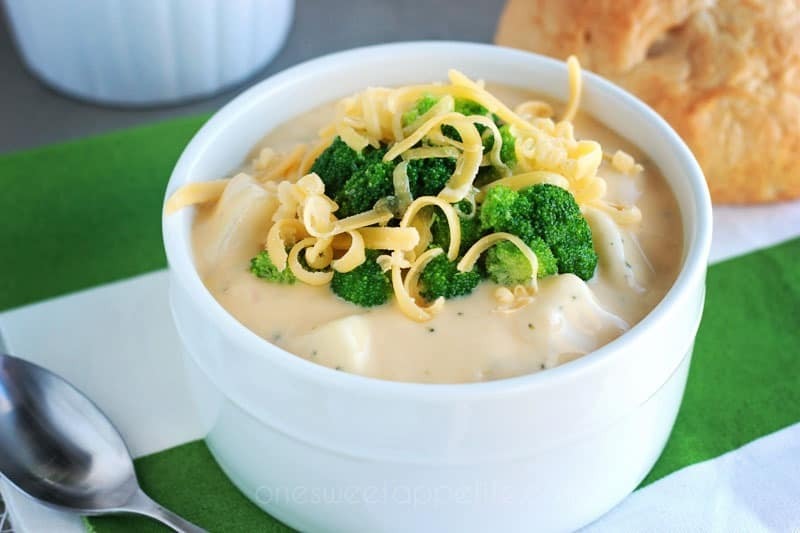 Stir in your frozen broccoli and cook an additional 10 minutes or until the potatoes are fork tender. Remove from the heat and stir in the Velveeta and bacon. 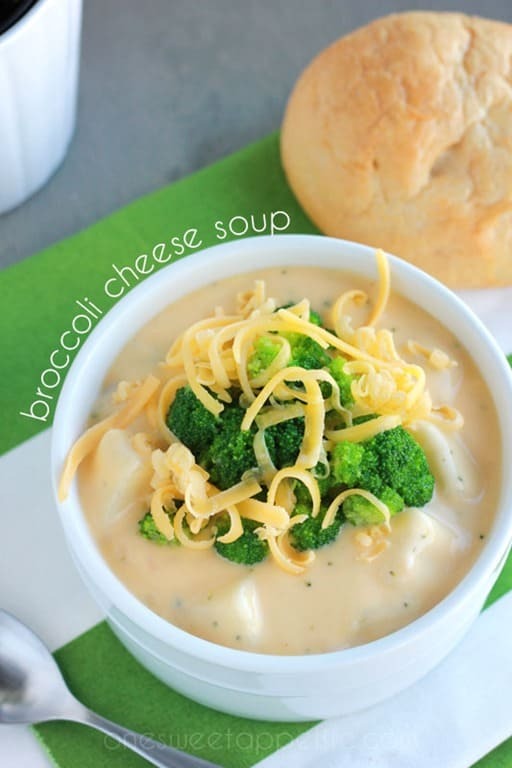 Top with shredded cheese or more bacon bits and enjoy! Hi Jesseca! I’m keen on trying this recipe, but here in Australia, grocery stores don’t sell Velveeta. What can I use as a substitute?